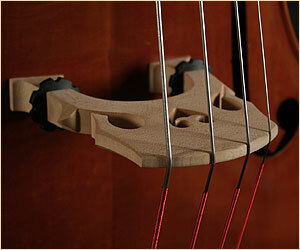 We are currently sold out of our EG basses. We are temporarily substituting these with another good and affordable carved bass. 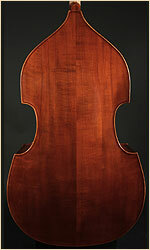 Please see our new page dedicated to these specially priced (and fully carved) basses. If you have ever tried looking for a new carved bass under $3,000 before, you know that it is next to impossible to find something that is high quality, well made, includes a professional set up and at the same time....dependable. 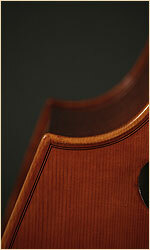 These basses are made by the same people that make our famous Emilé Gillet fine cellos and are specially made for us. 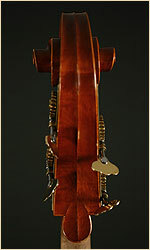 They are fully hand carved basses. (Even the back is carved!) 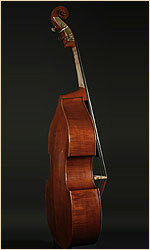 The Gillet upright bass is modeled after an Amati bass and is a normal, 3/4 size bass. The top is made with quality spruce. The neck, sides, and back are all solid maple and have nice ebony fingerboards. 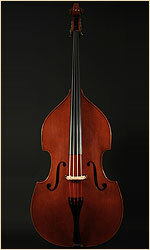 The bass plays with a warm tone and it is amazing at any price. 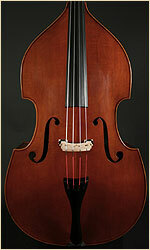 This bass (like our Wan-Bernadel upright basses) is recommended to only ship by air cargo. See more about trying a bass at our How to Try a Bass page. Who buys these? For the money, the new Emile Gillet basses (pronounced Jee-Lay') are actually even cheaper than some expensive plywood basses being offered elsewhere. 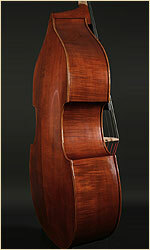 They are made just as well or better than the expensive hybrid upright or carved upright basses much more in price. 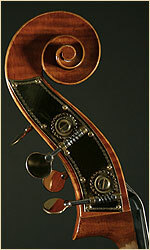 The Gillet basses have quality workmanship, a beautiful appearance and sound. They also come with a 2 year warranty to assure our quality. Again, our reputation for quality is unrivaled and is our first priority. New! Check out our new, special Amazing Bass Packaged Deals page where you can add a pickup or any other accessory that we offer here. Bass measurements: length of back 43 3/4", width across shoulders (upper bouts) is 19", lower bouts 25 1/4" and the string length is 42". Email us. How we are able to get the prices cheap? The wood is well seasoned and aged (fully warranted), but is a simpler more plainer wood grain. There is naturally some flame and grain in most of these basses, but because it is a plainer wood grain, it helps keep the price down. 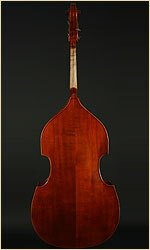 Keeping in mind that about 95% of all the early 20th century German carved basses used only plain maple. The varnish is a beautiful hand applied spirit varnish. While the tuners are German Rubners, we use their cheaper plate tuners which are still really nice tuners, but not the most elaborate. All other accessories used are specially approved for quality and workmanship. We let the customers choose any brand strings that we offer. 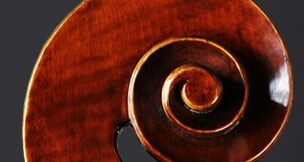 (For gut strings, a little extra is charged.) We even include a good, deluxe padded bass tuff-Bag cover with the bass. Lastly...why the cheap price tags? 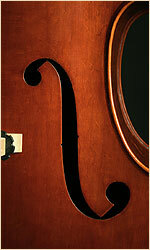 We wanted to offer a good, solidly built bass, that will easily rival any other bass in price and quality.